t*rexes and tiaras: Tuesday Titles 154.. In a desperate attempt to assist with the current spring clean of my bookshelf at home, I've been reading my way through some of the books which have been on my "to read" shelf, in order that I can liberate them to new homes. This week, amongst other things, I read The Ice Cream Girls. If you'd not heard of this, you might be mistaken for thinking it's a teenage-y chick lit romance, but you kinda couldn't be further from the truth. This one should probably come with a trigger warning, as it's two main characters, Poppy and Selina are linked not in friendship, but rather by a man they are both in love with. A man who happens to be much older than them, when they first meet him as teens. The girls are victims of abuse, and it's fairly heavy-going, so I wouldn't recommend this if you were looking for that easy-going chick lit. Things come to a head one fateful night and the lives of the girls are linked forever, as they'll never be able to escape what happened. Or will they? Skip forward twenty years or so, and we see how Poppy and Selina have moved on with their lives, their families and how they've hidden the truth from the people they love the most. Whilst I liked the way in which the narrative skips between girls and back and forth through time; it was still easy to follow the story, I did wonder why there were several threads of intrigue which just got left behind. (e.g. I wanted to know what happened with Mez' marriage after her heartfelt confession). Naturally, things are wrapped up in the final few pages of the book and I have to admit, not exactly how I'd expected, which was promising - I like a book which keeps me guessing. In finding the photo, I realise this must have been adapted for television, which I can see being quite successful. 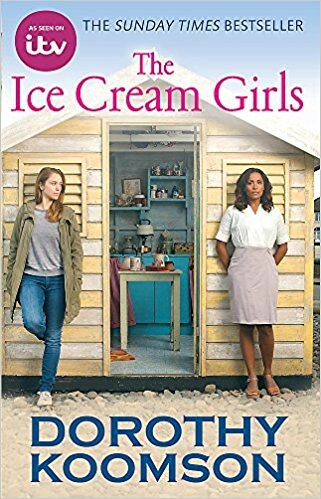 Have you read / watching The Ice Cream Girls?